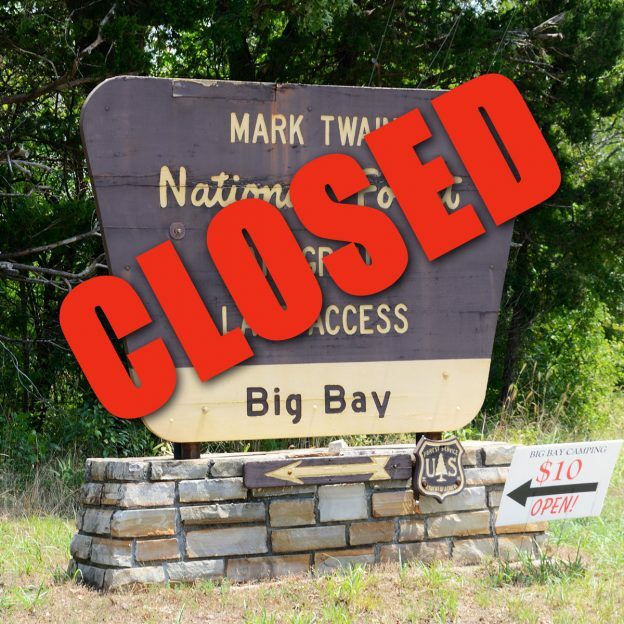 Mark Twain National Forest has announced it is permanently closing the Big Bay Campground on Table Rock Lake, near Shell Knob, Missouri. The near-by Big Bay boat launch and picnic area remains open. The press release states that “The campground closing is part of Mark Twain National Forest’s long term recreation site management plan. This entry was posted in Camping, News and tagged Big Bay Campground, Mark Twain National Forest, Missouri, Ozarks, Stone County, Table Rock Lake on May 5, 2013 by Gary. What does your MO look like? VisitMO on Facebook asked “What does your MO look like?” this was our answer. This entry was posted in Campfire Chat, Places to Go, Places We've Been and tagged Big Bay Campground, Busiek State Forest and Wildlife Area, Harry S Truman Lake, Hercules Glades Wilderness, Piney Creek Wilderness, Sac River Trail, Truman Lake on February 5, 2013 by Gary. Welcome to our gallery of photographs taken at Big Bay Campground. This entry was posted in Camping, Photo Gallery, Places to go Camping, Places We've Been and tagged Big Bay Campground, Big Bay Recreation Area, Ozarks on September 5, 2012 by Gary. This entry was posted in Camping, Camping trips, Places We've Been, Trip Reports and tagged Ascend D10, Ascend FS10, Barry County, Big Bay Campground, Mark Twain National Forest, Missouri, MSR Mutha Hubba, Ozarks, Table Rock Lake on August 18, 2012 by Gary. On the shore of Table Rock Lake, near the town of Shell Knob, Missouri, lies the Big Bay Recreation Area. Unique on Table Rock, it’s the only campground owned by Mark Twain National Forest. It’s a primitive campground, meaning there is no electricity, no drinking water or showers, though there are flush toilets. But most of the 35 campsites are along the shore of the lake which can be accessed by a short path. Screening between the campsites is quite good, so it’s a great place to have your own little private summer lake holiday. This entry was posted in Camping, Places to Go, Places to go Camping, Places to go Paddling, Places We've Been and tagged Big Bay Campground, Big Bay Recreation Area, Mark Twain National Forest, Missouri, Ozarks, Shell Knob, Stone County, Table Rock Lake on April 29, 2012 by Ginger. This entry was posted in Camping, Camping trips, Trip Reports and tagged Big Bay Campground, Camping, Mark Twain National Forest, Missouri, Ozarks, Table Rock Lake on June 20, 2010 by Gary.